California's Central Valley is a large, flat valley that dominates the geographical center of the U.S. state of California. It is 40 to 60 miles (60 to 100 km) wide and stretches approximately 450 miles (720 km) from north-northwest to south-southeast, inland from and parallel to the Pacific Ocean coast. It covers approximately 22,500 square miles (58,000 km2), about 13.7% of California's total land area (slightly smaller than the state of West Virginia), and is home to some of California's most productive agricultural areas. Black: "The Central Valley Project is one of the largest manmade rearrangements of water ever attempted -- a series of canals and dams that span the state, that supply the farms of the Central Valley with water. And this entire infrastructure, starting in the Delta, where you have these huge pumping stations that are essentially making a river run backwards, uphill, taking on immense amounts of water to pump it south to Central Valley farmers -- that whole concept is coming to an end. ..."
The 3:30 minute video was posted at Circle of Blue's website to accompany a January 19, 2014 report by Jeremy Miller, California’s Lingering Drought and Pollution Defy Solutions: Less snowmelt from Sierra Nevada leads to more pumping of Central Valley’s contaminated groundwater. The report is illustrated with black and white photographs Black took for the video. They are at jarring, disturbing odds with images of the fabled Golden State's sun-drenched landscapes. About a year ago I still believed that with enough pluck and ingenuity Californians could save their state from the worst effects of a catastrophic drought. I hadn't read the Circle of Blue report, didn't even know about the organization. I was at the start of a long journey of discovery about water issues. The state will be saved. The fable will be lost in time. “We are moving from a water-stressed to water-scarce situation"
We described India’s coal paradox. India is a nation rich in supplies of indigenous coal but unable to develop them efficiently. One big challenge is finding sufficient water to keep coal-fired power plants humming. In the coal-belt region of Chhattisgarh, many farmers worry new plants will divert precious river water. See Circle of Blue's 2008 study, China, Tibet, and the Strategic Power of Water. to learn how China's water scarcity threatens India and other countries that depend on Tibet's rivers. Drying of California's Salton Sea: "An air quality disaster unparalleled in the world"
"If the Sea dries up it's going to be uninhabitable because of the dust here, throughout the whole Coachella Valley,"
Part of my steep learning curve this past year about water issues is discovering that degradation of just a single small body of water can generate large problems that at first glance don't seem related to it. The sea, which sees some 400 species of migratory birds pass through, was born from a civil engineering accident in 1905, which led to an overflowing of the Colorado River. It lies 71 meters above sea level, south of Joshua Tree National Park, some 250 kilometers (155 miles) southeast of Los Angeles. In the 1950s and 60s, the banks of the Salton Sea were a playground for southern California's rich set, who would come for water-skiing, yacht-racing and fishing. At the time it was more than 50 kilometers in length and 20 wide. This former seaside resort today looks like a ghost town, its beach marred by an earth mound and scattered with the wrecks of cars and rusting metal of all sorts. From 1970, the Salton Sea began to shrink, leading to a surge in salinity and a reduction in depth which ended its days as a fishing and boating haven. To make matters worse, in 2017 a complex agreement which shares water from the Colorado River comes to an end, leading to an expected further decrease in water flowing into the Sea. Wilcox said the body of water will lose a third of its surface area in just a few years, while its bed of sand mixed with sediments of cadmium, phosphates, fertilizer and insecticides will spread further, carried by frequent storms. Krantz said: "The Salton Sea is like a soccer field with only 2 centimeters of water in it. It is super-sensitive on any reduction of inflow. "It would be an air quality disaster unparalleled in the world," he said, a stark warning in a region inhabited by some 1.5 million people. Cases of asthma, lung cancer and other respiratory conditions could surge in an area where they are already four times the national average. Not to mention the billions of dollars in agricultural revenues threatened, and real estate prices which risk collapsing. "If the Sea dries up it's going to be uninhabitable because of the dust here, throughout the whole Coachella Valley," said Randy Rynearson, the salt-and-pepper grizzled owner of an ironmonger's store in Salton City. The consequences for the ecosystem could be even more catastrophic, decimating the few fish who remain in the Sea, as well as birds deprived of a key stopping off point on their migratory flight path. Local public bodies, environmental militants and researchers are trying everything to convince California's government to act, and to free up funds. Numerous projects have been launched—some more realistic than others—such as the construction of pipework bringing water from the Pacific or the Gulf of California. These projects would cost between five and 10 million dollars. But a study by the Pacific Institute said the cost of inaction would be even higher, at $20 billion to $70 billion, not to mention the risks of interminable legal action by residents falling sick from a a long-expected disaster. "The Golden State more than doubled its solar output last year and now hosts two of the world’s largest solar plants." That's the lede from California is first state with 5% of its electricity from solar by by Tom Huddleston, Jr.; March 24, 2015; Forbes. They always knew it would happen, someday. Someday in the distant future. They didn't factor in the cascade effect and convergences in an age of megapopulations, megabillion dollar government budgets, and mega-stock markets. They didn't factor in the odd leaps that technology can make. Amman's towering skyscrapers, glitzy new suburbs, and slumlike neighborhoods on the outskirts tell the tale of a population that grew by 86 percent between 1990 and 2008, according to the World Bank. The population explosion isn't the tale. The tale is in the infrastructures of the city of Amman and its towering skyscrapers and the belief that they represent modernity. They represent artifacts of the past. Governments in water stressed regions will either confront this or perish as completely as the Assyrian empire. What's masked this for so long is simply that the wealthiest Western countries can support obsolescence longer than ones that had no business copying a way of life their climates couldn't sustain. One of the joys of National Geographic is that because it's not a newspaper the editors find nothing strange about an author wandering so far afield the article is actually two or more in one writing. This style of reportage can be hard on those who just want the basic facts but the fun part is that readers unexpectedly learn about a topic they hadn't even considered before. So it is with Peter Schwartzstein's eyes-on-the-ground report for National Geographic, Biblical Waters: Can the Jordan River Be Saved? published February 22, 2014. The lede is, "With the swelling ranks of Syrian refugees in Jordan, an overstressed river is at risk of going dry." Actually, as the report makes clear, there are factors going back many decades before the refugee crisis that primed the world's most famous river for extinction. And if the objective was to ask whether the river could be saved, a couple paragraphs about the impact of Syrian refugees would have sufficed. Nonetheless Schwartzstein and his editor decided it was high time for readers outside the world of humanitarian aid to understand a little about how human nature can act when it finds itself a refugee. At one point in the reading I couldn't help bursting into laughter. Sure there's nothing funny about the crisis but it was the laughter of recognition. As soon as I got myself oriented in a refugee camp I too would want to get hold of a washing machine. "There's been a lot of privatization of water resources," Palo said, putting a euphemistic spin on the semi-criminal activity that has included some strong community leaders assuming ownership of public wells. It frequently appears on the news as a devastating illustration of the human toll of the Syrian conflict, but it's also a compelling reminder of the additional strain levied on the region's water resources. Four million liters (more than one million gallons) of water a day is brought into the camp by 255 tankers, which works out to about 40 liters (10.5 gallons) per person; an emergency daily standard is 18-20 liters. It's an excessive amount, UN officials admit, but camp occupants have made a habit of taking matters into their own hands, and additional supply is needed to ensure there's enough to iron out the imbalances. Some 71 percent of Za'atari residents have installed their own toilets, 8 percent have their own water tanks, and many families have hooked up personal hosepipes. There are even 1,500 private washing machines, all of which tap into the camp water supply. And it's not just water that's reappropriated: Many washrooms and other communal sanitation facilities, which are needed to reduce the risk of disease, are often dismantled soon after they're built, with their parts plundered for private use. You can bet the washing machine owners do a brisk business in renting use of the machines. An old farmer sleepily perched next to his fruit stand outside Mafraq sadly shook his head and just repeated "too many people, too many people," when asked about the influx of new arrivals. "People do pretty much what they want," said Kilian Kleinschmidt, the German UN official who administers Za'atari. "They've connected themselves to electricity and water, whether we would have done it that way or not," he said. Syrians are frequently accused by local Jordanians of having a cavalier attitude to water use, and it's not an entirely groundless charge. Many refugees come from parts of Syria where there's an abundance of water, and most haven't yet accustomed themselves to Jordan's more straitened environmental circumstances. "They're not water conscious," said Kleinschmidt, who's trying to phase in a system of water meters, which he hopes will assuage the complaints of locals resentful of the Syrians' access to free water. It might be more accurate to say many came from parts of Syria where there was an abundance of water. Surely all Syrian adults in the camps remember the catastrophic drought that struck their nation from 2006 to 2010 and lingered in some parts to 2011. I don't know of a published estimate of how many Syrians fled their country before the war and because the drought destroyed their livelihoods and livestock. But I'd say it's a fair guess that several refugees fit that category. In any case it wouldn't take a Syrian more than a few days in Jordan to realize that even for many Jordanians the water situation is difficult. This wouldn't rule out water extravagance, for want of a more descriptive term. I learned from a report about Iran's water shortages that people in Tehran are in the habit of leaving their house water taps open all day. And a report I featured recently on Pakistan's water shortages quoted an official who said that Pakistanis were extravagant with water. This kind of extravagance could even be noted in the reaction of many Californians when they were first asked by the state's governor to conserve water after the drought deepened last year. Water usage spiked. However, I think there's an even bigger psychological component to the kind of water usage that Peter Schwartzstein described, one that doesn't specifically relate to water. When people have to flee to what is in essence a homeless shelter, a healthy defense against mentally crippling trauma is to attempt to control some aspect of their environment, especially as it applies to the most personal needs -- toilet, bathing, keeping clothing and private surrounds clean. So I think the behaviors Schwartzstein described relate in great measure to humans trying to make some kind of home for themselves under conditions that are almost as dehumanizing as prison. The Jordanian government's soft-pedal approach to the Syrian water hogs, which is reflected in the attitudes of UN advisors, could well be tacit acknowledgment of this. It's just that Jordan isn't situated in a rain forest. But long before the Syrian war exploded, Jordan had greatly overstretched its water resources. The oasis at Azraq, in the desert to the east of the capital, dried out in 1990, with the water table dropping from 4 meters above the surface to 20 meters below it today. Groundwater is now being pumped into the oasis, once known as a bird-watching hot spot, to keep it alive as a tourist attraction. Both of Jordan's principal aquifers have been overpumped by 300 percent, which means a fall of about a meter a year—far quicker than they can be replenished. Such excessive extraction is also having a grave effect on water quality. "When you're overpumping aquifers like this, you're mobilizing a lot of salt water, so it's not drinkable," the UN's Palo said. Once giving the reader a tour of the refugee camps from the unusual vantage point of water usage, the report turns to issues with the Jordan River that greatly predate the Syrian refugee situation, These form a kind of Rubick's Cube involving the Sea of Galilee, Red Sea, Dead Sea, Jordan River, and human nature at work in Israeli, Jordanian, Syrian, and Palestinian disputes about water. The upshot is complex Eleventh Hour projects to save the river and create additional potable water. The simple part is that too many people have converged on too few freshwater sources. This reduced the Upper Jordan River to a creek so polluted Schwartzstein avers Jesus would have injured himself if he'd stepped in its waters today. The cascade effect -- one situation generating others that intensify the effects of drought to create a vicious cycle -- is on display in the following two reports. But in the third report, we see how the cascade effect can lead to a positive cycle. Armies of tiny bark beetles are ravaging drought-weakened pine trees throughout California in a fast spreading epidemic that biologists fear could soon turn catastrophic. The rest of the report is behind a subscription wall but from the caption for the accompanying photograph, "A resident of Truckee tends a small permitted burn to clear pine cones, dead branches and pine needles to protect his property before before fire season begins," it looks as if the best defense against the beetles is very limited during fire season, which is now more or less year 'round in parts of California that are bone dry. The abominable snowpack in the Sierra Nevada reached an unprecedented low this week, dipping below the historic lows in 1977 and 2014 for the driest winter in 65 years of record-keeping. Electronic surveys show the water content of the snow throughout the Sierra is a shocking 8 percent of the historical average for this time of year, by far the driest it has been since 1950, the year record-keeping began, because of the lack of rain and snowfall and the exceedingly high temperatures. The state has been publishing statewide snowpack measurements in the Sierra since 1950, but there are several places where measurements go back as far as 1926. The measurements are important because snow makes up 60 percent of the water that is captured in California's reservoirs when it melts in the spring and 30 percent of the state's overall water supply during a normal year. Curiously, California's biggest reservoirs have managed to hold steady despite the dismal snowpack. Shasta Lake, the state’s largest reservoir, has 74 percent of what it normally holds at this time of year. Lake Oroville, the second-largest reservoir and the most important source for the State Water Project, is carrying 67 percent of what it normally holds at this time of year. Shasta and Oroville carry 80 percent of the state's reservoir supply. The water is used to irrigate 8 million acres of farmland and quench the thirst of close to 30 million people. 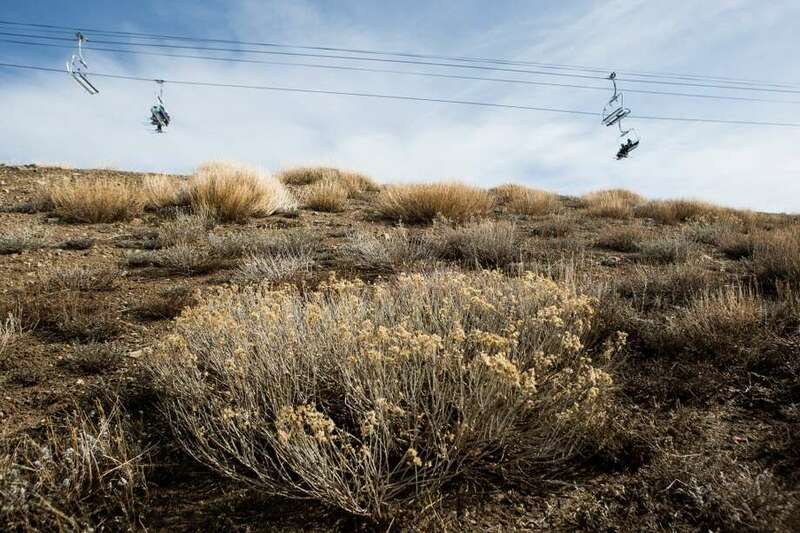 The problem, experts say, is that the reservoirs will not be getting much additional supply from snowmelt, a crucial source in California’s dry Mediterranean summer climate. Meanwhile, the reservoirs that serve farming communities are wretchedly low. Pine Flat Dam on the Kings River is only 32 percent of normal, and Exchequer, or McClure Dam, on the Merced River stands at only 16 percent of normal. Some of the smaller reservoirs are in real danger of going completely dry this summer. Meteorologists see nothing on the horizon that could pull the state out of its increasingly frightful drought. NASA is using cutting-edge technology — an airborne snow observatory equipped with lasers — to measure the snow depth. Tom Painter, the lead investigator for the observatory, says NASA's equipment doesn't just gauge how much snow is up there. A spectrometer also looks for "reflectivity" — how much sunlight it absorbs. "The reason we need to know that is that the absorption of sunlight is what controls the timing of the snow melt," Painter said. "The timing of that and knowing how much is going to come out is absolutely critical to the operation of those reservoirs — to meeting the water users' needs and also making sure that you can capture the water you need to generate electricity." Yes. Hydropowered Electricity. Which brings me to a March 27 report, updated March 28. from California's Sacramento Bee, filed by Dale Kasler (California’s hydro power dries up as drought worsens; utility customers paying more). The drought is drying up California’s once-plentiful supply of cheap hydroelectricity, and utility customers are paying for it. SMUD said it expects to raise rates slightly, starting with April’s bills, to compensate for the use of more expensive energy alternatives. Roseville’s city-owned utility has imposed a 2 percent “hydroelectric surcharge” on ratepayers since last July. PG&E consumers have been shouldering a 1.5 percent rate increase for more than a year to cover the cost of replacing inexpensive hydro. While there’s little fear of blackouts this summer, the scarcity of water has slowed the state’s far-flung network of hydro turbines practically to a crawl. Hydroelectric production in California plunged 60 percent from 2011 to 2014, according to the U.S. Energy Information Administration. Estimates for 2015 aren’t available yet. That’s forcing utility companies to rely more heavily on power from natural gas-fired plants, solar farms and other sources, all of which are pricier than hydro. Despite the water shortage, the state should be able to endure the summer with enough electricity to go around. In a preliminary forecast, the California Independent System Operator believes supplies “will be sufficient, even in the worst case scenario,” said spokesman Steven Greenlee. The ISO runs the state’s transmission grid. Nonetheless, the drought is forcing utility managers and others to take a hard look at the network of reservoirs and dams that has become such a big part of the power picture. California has traditionally been one of the leading hydro-producing states, trailing only Washington and Oregon. In a typical year, hydro is responsible for 15 percent of California’s electricity supply. Last year, that sank to just 8 percent, according to federal data. That’s robbed the state of millions of megawatt hours from one of the least-expensive energy sources around. [Robert B. Weisenmiller, chairman of the California Energy Commission] and Stanley Young, spokesman for the California Air Resources Board, said many utilities are looking to non-carbon alternatives such as solar and wind power to offset the decline in hydro power. “You’re seeing a really big growth in wind and solar,” Weisenmiller said. Solar power generation in California nearly tripled last year, a growth rate that was enough to offset 83 percent of the loss in hydroelectricity, according to the Energy Information Administration. California got 5 percent of its power from solar last year and 7 percent from wind. State law requires utilities to generate one-third of their electricity from renewable sources by December 2020. The good news is that alternatives to hydro, including renewables and gas-fired generation, have fallen in price in recent years. But they’re still more expensive than hydro. There's much more to Dale Kasler's highly informative report; the entire report is well worth the read. But I want to zero in on the passages I just quoted. It almost looks to me as if the state got in the habit of using water to make electricity even when it was feasible to switch to water-saving alternatives. And now adversity is finally giving a big leg up to technologies that will allow California to transfer oceans of water to other sectors where it's desperately needed. And I'd assume that with more usage, the price for the alternatives will come down. Also, the report mentions that Roseville residents aren't complaining about the "hydropower surcharge," which amounts to less than $2 a month. They might start complaining if the "green" technologies replace relatively cheap carbon alternatives. But while I'm saying this as an onlooker, sometimes it takes a hard push to move forward. Isn't it so? Yesterday I took a good-natured if exasperated swipe at Phys.org because they headlined their report about research on Syria's water crisis "Did climate change help spark the Syrian war?" They were only quoting the claim made by the researchers, and at least they didn't add "manmade" to the title. Yet it was very clear from the report that actually water shortages helped spark it -- all of them human-made. But the organization is a great resource for reports about water issues that don't get much if any attention from the mainstream press. I'm going to be quoting from a handful of their reports, so I thought it only polite to take a moment to thank all the people involved in the site, which makes its reports free to the public and without putting the reader through any hoops. Here is the link to the water section; it's simply lists of hyperlinked report titles as they come available. The lists run many pages. So when they say "water" that means everything to do with water -- from cutting edge experiments to purify water, to research on farms in the Atacama Desert abandoned 500 years ago, to headlines on California's drought. To spend a few minutes perusing the report titles is a fast way to get an appreciation for the incredible scope and urgency of water issues. Phys.org™ (formerly Physorg.com) is a leading web-based science, research and technology news service which covers a full range of topics. These include physics, earth science, medicine, nanotechnology, electronics, space, biology, chemistry, computer sciences, engineering, mathematics and other sciences and technologies. Launched in 2004, Phys.org’s readership has grown steadily to include 1.75 million scientists, researchers, and engineers every month. Phys.org publishes approximately 100 quality articles every day, offering some of the most comprehensive coverage of sci-tech developments world-wide. Quancast 2009 includes Phys.org in its list of the Global Top 2,000 Websites. Phys.org community members enjoy access to many personalized features such as social networking, a personal home page set-up, RSS/XML feeds, article comments and ranking, the ability to save favorite articles, a daily newsletter, and other options. When I make time I'm going to find websites that focus exclusively on water issues or like Phys.org have a big section about them. For now I generally prefer the hunt and peck method of using keywords; a look at the titles in Phys.org's water section explains why. I'm like a kid in a candy store when I visit. All right. Again, thank you, a heartfelt thanks, to the people who make the website possible and highly readable, and a thank-you to all the contributors to the water section. Phys.org is truly performing a vital public service. I'll close by noting that visiting the site is a great way to banish the blues. Yes, we're all going to hell in a hand basket but there are many, many very bright and concerned people working like mad to slow the march. One recalls that after spending a little time at Phys.org. 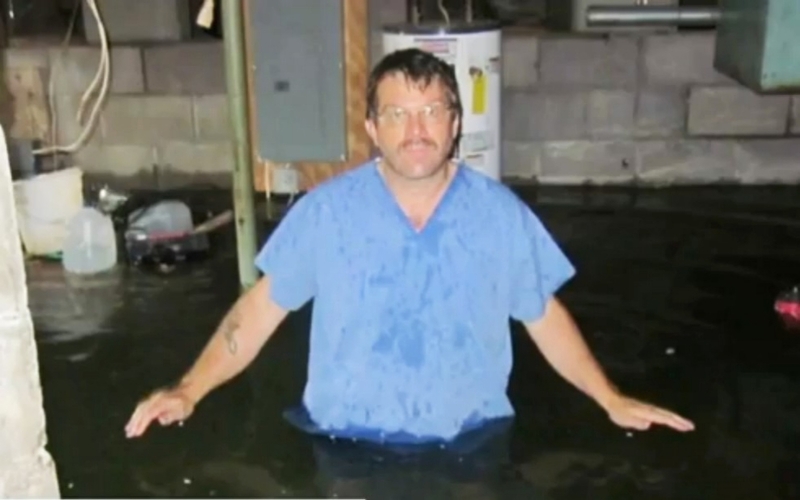 Wawarsing resident David Sickles in his basement, waist-deep in water. [New York City's water infrastructure] is "... the largest, single capital investment that New York City has made, including the subway systems." That constant investment has been needed to keep up with the explosive growth of the city. In 1930s, and again running out of water, New York City built what many consider to be the crown jewel of its water infrastructure: the Delaware Aqueduct. Finished in 1945, this deep rock pressure tunnel tapped into the Delaware watershed and was designed to deliver up to 850 million gallons of water per day to New York City. On any given day, it delivers anywhere between 50 to 80 percent of the city’s water. But over the years, the residents in a neighborhood of the small upstate town of Wawarsing, located over the aqueduct, began to notice something odd. Whenever it rained, roads backed up, basements flooded. But while the aqueduct is wasting twice the amount daily that the [massive July 2014] UCLA water main break did in its entirety, the waste isn’t what worries Bill Wegner, the staff scientist at Riverkeeper, a watchdog organization that monitors the health of the watersheds that feed New York City. "Worst-case scenario is you'd have a catastrophic failure,” he said. "If the tunnel, which is under pressure, were to collapse, the whole aqueduct would have to be shut down. Fifty percent of the city’s water supply would cease to exist." A 2001 report published by Riverkeeper concluded that New York City’s reservoirs would run out of water in just 80 days. "If you do the math and figure out that the city's going to be hurting for water for 50 percent of its consumers, it is really a catastrophic event," Wegner said. And the city would be out of water for years, the amount of time experts estimate it would take to make the repairs, according to the Riverkeeper report. Of course the water authority is no longer sitting on its hands. As the Al Jazeera report details, a very expensive, lengthy, and complicated project, which includes construction of a bypass tunnel (started in November 2013), and expanding water delivery systems from other water sources, has been underway. The estimated finish date for the bypass will be 2021, but that'll only be completing one phase of the all-over project; then the Delaware aqueduct has to be shut down and dewatered in order to fix its leaks and connect the new bypass to it. Until then the nightmare hangs over New York City like a Damocles sword. I've been learning that big water problems are not confined to arid or semi-arid regions, nor do they necessarily follow a typical drought pattern or even a water misuse pattern. But this situation with New York went on for a long time before it was addressed despite vociferous complaints from state residents like David Sickles. Why? Because Warwasing doesn't have clout in the Borough of Manhattan's city hall or the state's capital. Why didn't I think of that earlier instead of just grousing about the Manmade Climate Change narrative hogging the water crises spotlight? In last August's "Swept Away" I wrote that it was past the time for recriminations. But these damn "narratives," which governmentalists love so much, hide so much truth. It's past time to put up a counter-narrative because the Manmade Climate Change people and their Manmade Global Warming fellows cried "Wolf" so many times that most people tuned out -- and they're not tuning in the way they need to about the water shortages. I mean, the Syrians grew cotton for export -- until the drought there got so bad they didn't even know where their drinking water was going to come from. Who cultivates cotton on an industrial scale in an arid climate? Californians, for one. Now tell me what that has to do with climate change. Yes, the climate did change in Syria and California; it got hotter, at least for the present. But before we try to lower the Earth's temperature, why not go for the low-hanging fruit? Like cultivating a little common sense about water usage. I went to the site, my first visit there, to read a report on Oregon's deepening drought headlined, "Oregon Drought fuels unease about state's long-term water security" datelined yesterday. I'd found the report on Google News when I keyed in "drought." The copy in the report was blanked out; the only way I could read it was if I took a little survey on how I felt about computer technology OR graciously "shared" the report. So this isn't a subscription wall or pay wall -- or even an attempt to get my email address by asking to forward the report to my inbox. I could read the report, for free, provided I behaved in a way the people who run the online newspaper directed me. I'd never seen anything like it. Well, I can't give any more time to Oregon and I'll not waste my time again visiting the Oregon Live site. If the drought in the state gets bad enough the national press will track it closely. It seems a concern is that the weather pattern drying up California is spreading to Oregon. There's also a website called "The Oregon Story" run by Oregon Public Broadcasting (OPB). The site has a backgrounder to the Oregon drought, which I know from plowing through 100,000 reports during the past year on droughts is never only about the weather. Oregon has a reputation as a leader in environmental issues, but in this case, we are following other Western states into an extended, widespread drought. A drought in Oregon? Yes. Because drought isn't always caused by a lack of water. It can also be the result of too many people competing for a limited supply. Our recent water shortages have led to some highly publicized conflicts. But in the background, a broader crisis has been brewing, and it affects every person in the state. The shortage also has an impact on our fish and wildlife, the food we eat, the water from our faucets, our livelihoods, our play and our economy. In this section of The Oregon Story, you can learn about the sources of Oregon water, see how an old law has shaped the current situation, and consider the many ways that Oregon depends on a stable water supply. All right. On to the Salton Sea and the Jordan River. Sigh. To think I used to complain about the complexity of the Afghan War. But I've learned that water shortage crises have one thing in common with wars: no matter how different the details and no matter how complex they boil down to a surprisingly small list of drivers -- the same drivers. "We must use what has been called 'smart power,' the full range of tools at our disposal -- diplomatic, economic, military, political, legal, and cultural -- picking the right tool, or combination of tools, for each situation," Clinton said in her opening remarks. "With smart power, diplomacy will be the vanguard of foreign policy." Ah, but one is only as smart as one's knowledge base, which is the perennial problem with choosing advisers. If you, yourself, don't know as much as they about a particular strategic situation, it's easy to pick a screwdriver from the toolbox when you actually need a wrench. The only fallback for ignorance is to possess a large store of common sense that can be applied to matters of defense and foreign policy. If both knowledge and sense are lacking, this is how a government can smartly power its way to the verge of World War Three. I was sharply reminded of this last night when I listened to John Batchelor talk with Victor Gaetan of the National Catholic Register about the Christian Church's side in the Ukraine crisis. There is more than one side, it turns out, there being more than one kind of Christianity in the country. Gaetan did his best to explain the situation in simple terms, but I'm afraid that after five minutes I started feeling a little seasick trying to keep up. One really has to enjoy learning about the ins and outs of religious history to even have the will to get one's bearings in the situation. Well, it's complex, as are all disagreements that have been going on for a thousand years or so, It's just that the Obama Administration and its foreign office overlooked the religious part of the political aspect in Ukraine. Which it turns out is more important than might seem immediately evident. And so the Obama Administration fell prey to lobbyists and agendists who want to promote a one-dimensional view of Ukraine's relationship with Russia. Repeat the sentence with "Arab Muslim countries" instead of Ukraine. So what is to be done with the American habit of wading into situations in foreign countries it understands not at all? I venture there are too many Grand Master chess players in America's defense/diplo establishment and not enough ping pong players. The name-calling in that part of the world is getting more colorful than usual reported Ambassador Dennis Ross to John Batchelor last night, as the melee in the Middle East careens toward Black Friday at Best Buy with bombs and automatic weapons. Everybody is fighting everybody else, coalitions unimaginable two years ago have formed and reformed with dizzying speed. Through all the confusing events leading to the outbreak of the region-wide war, Batchelor has managed to keep accurate score but also handicapped so well that much of what is happening today in the Middle East is old news to his radio audience. A big chunk of Batchelor's show last night was dedicated to guests' analyses of the current scoreboard. But if you're late to the melee I'd suggest listening to two of his talks in February with strategic analyst Gregory Copley. They're a good crash orientation to the furniture rearrangements that have radically altered the geopolitical map in a matter of months. Gregory Copley also wears the hats of author, historian, and erstwhile industrialist in addition to his consulting work for the highest levels of governments around the world. He's also founder and Editor-in-Chief of Defense&Foreign Affairs group of publications, founder and Director of GIS (Global Information System), co-founder of ISSA (International Strategic Studies Association), and has competed barefoot in the Marathon des Sables. I am joking about that last, I hope, although I wouldn't put it past him; he's a tough Aussie. But it's no joke he has the kind of mind well suited to analyzing the free-for-all era of Westphalianism -- as does John Batchelor, by the way. And of course as does Pundita, which is how I know Copley and Batchelor can chew and walk their way through data maelstroms. Ah! I see from the author bio for one of his books that Copley has written extensively on the role of monarchies in governance. I must try to learn whether he's studied Thailand King Bhumibol's Sufficiency teachings, which I think if adopted on a wider basis could go a long way to solving the problem of today's societies gobbling their own tails. In the way they're doing in the Middle East, to bring the conversation full circle. Be sure to listen to the Feb 20 segment first. I'd also check out Eli Lake on his visit to Baghdad (he's reporting for Bloomberg View nowadays); second segment in the Feb. 20 block linked above. The intelligence he reported is still vital. "[...] In the course of his visits to people in the rural areas, His Majesty reckoned that a large number of his subjects were not able to support themselves. He was determined to make them self-sufficient, so that they would be better able to contribute to national development. 4. However, if each household has its own pond, the combined stored water can match that of a large reservoir, involving less investment and directly benefiting the local people. The hard-working monarch, who had intimate knowledge of the people's problems and had been advising those in the agricultural sector, who made up the majority of the population, spelled out the "New Theory" in his Sufficiency Economy philosophy.[...]" That's it; that's the cancer that's metastasizing: they're hollowing out the countrysides in all these nations and shoving the rurals into larger and larger urban areas that are squeezing out the reservoir capacities meant to serve the urbans. Of course there are additional problems with water storage but King Bhumibol nailed it decades ago. There's no way this situation can continue. Sao Paulo is already facing the collapse of its major reservoir. How many reservoirs did that foreign ngo dig for the Lebanese? Was it 10? Bah, that'll last them a year or two if the birth rate and the refugee population from Syria keeps swelling. It's the same with dams; those things are monsters so only so many can be built. The only humane, sustainable route for many countries and even regions in the USA is the one King Bhumibol has recommended. Maybe a little less promoting of manmade climate change arguments and more organized data on MENA water shortages? After searching 20 minutes last night I was unable to find a weekly drought monitor map for MENA either as a whole or by country that's along the lines of the weekly US Drought Monitor. The little available by way of drought maps for MENA is a complete mess and completely incomplete. This means I'm still reduced to scraping together bits and pieces of data on a water crisis from news reports or blogs -- or from the kind of research paper that PhysOrg quoted earlier this month, which sent me through the roof. Gentlemen. Ladies. Transgenders. Visiting aliens from outer space. Now hear this. Are you piggybacking "manmade climate change" speculations on water crises because you know that's the only way they can get much attention anymore? It looks that way to me but for whatever reason, your insistence on putting manmade climate front and center adds a lot of distracting 'noise' to the already hideously complicated water shortage situations. The recent drought affected the so-called Fertile Crescent, spanning parts of Turkey and much of Syria and Iraq, where agriculture and animal herding are believed to have started some 12,000 years ago. The region has always seen natural weather swings. But using existing studies and their own research, the authors showed that since 1900, the area has undergone warming of 1 to 1.2 degrees Centigrade (about 2 degrees Fahrenheit), and about a 10 percent reduction in wet-season precipitation. The study's authors say Syria was made especially vulnerable [to the drought] by other factors, including sheer population growth—from 4 million in the 1950s to 22 million in recent years. Also, the ruling al-Assad family encouraged water-intensive export crops like cotton. Illegal drilling of irrigation wells dramatically depleted groundwater that might have provided reserves during dry years, said coauthor Shahrzad Mohtadi, a graduate student at Columbia's School of International and Public Affairs who did the economic and social components of the research. The drought's effects were immediate. Agricultural production, typically a quarter of the country's gross domestic product, plummeted by a third. In the hard-hit northeast, livestock herds were practically all obliterated; cereal prices doubled; and nutrition-related diseases among children saw dramatic increases. As many as 1.5 million people fled from the countryside to the peripheries of cities that were already strained by influxes of refugees from the ongoing war in next-door Iraq. In these chaotic instant suburbs, the Assad regime did little to help people with employment or services, said Mohtadi. It was largely in these areas that the uprising began. Like falling dominoes more than a million people then fled the war in Syria that followed in the wake of the uprising. They fled to Lebanon, further straining already strained water resources there. And so it goes. Aside: I'm not going to make the time right now to attempt to resolve the apparent contradiction, but for now: a Guardian article I quoted last year claimed that most of India's water for crops came from the monsoon. The Stratfor report makes it clear the claim is untrue or out of date -- or at least open to question, given the amount of irrigation shown on the second graphic. Because of its massive river systems and variety of climates, India is not always the first country that comes to mind when considering water stress issues, but the emerging regional powerhouse is still an agrarian society at its core. This already inefficient sector relies on inconsistent monsoons and, in some locations, on groundwater to make up for years with deficits in rainfall. Increasing urbanization and population growth have compounded demands for municipal water and increased agricultural production. By 2030, India is projected to consume nearly 1.5 trillion cubic meters of groundwater annually — more than its estimated 1.1 trillion cubic meters of usable reserves. As New Delhi faces a major challenge in managing this essential resource, India's highly decentralized system will make it difficult for the central government to effectively manage the problem. The history of the Indian subcontinent has been shaped by water. To the southeast and southwest, India's coastlines front the Bay of Bengal and Arabian Sea, while to the north, the Himalayas separate the country from Eurasia. Inside this self-contained world, a multitude of rivers have produced a variety of powerful city centers as well as the internal divisions that have resulted in India's strong regional identities — identities that centralized powers have always struggled to balance. Today, one of New Delhi's core geopolitical imperatives is to control the fertile Ganges River Basin, which is key to maintaining the country's agricultural sector. Agriculture accounted for 18 percent of India's gross domestic product in 2012 and employs about half of the country's population. It also accounted for more than 90 percent of total water withdrawals. While India does possess natural renewable water resources that total roughly 1.9 trillion cubic meters, rainfall distribution is naturally erratic and dependent on seasonal monsoons, leaving agricultural production highly susceptible to fluctuations. The 2014 monsoon season officially concluded at the end of September with cumulative rainfall 12 percent below the long-term average. Increased rainfall near the end of the season meant that more dire predictions from earlier in the year did not come to pass, but many crop production estimates for 2014-2015 are still expected to fall year-on-year. The Indian agricultural sector's reliance on groundwater irrigation to maintain crop yields, especially in weak monsoon years, has been steadily increasing since the 1950s. Over the past 20 years, 84 percent of added irrigation has come from groundwater sources. Today, 50-70 percent of India’s crops rely on irrigation — an estimated 60-80 percent of which uses groundwater. India's use of these resources is also extremely inefficient. The amount of water it takes to produce one ton of grain in India is 24 percent higher than the global average for both wheat and rice. Further exacerbating the water scarcity problem is the fact that not all of India’s water supplies are usable; much of the supply has been compromised by pollution or fertilizer use. Inadequate infrastructure prevents the use of some of the annual renewable water resources as well. India’s Ministry of Water Resources estimates that only 1.1 trillion cubic meters of the country's total 1.9 trillion cubic meters of natural renewable water resources are usable. Independent studies put this number at 650 billion to 750 billion cubic meters, less than half of India's total annual renewable amount. The greatest evidence of groundwater depletion can be seen in India's north, an area that includes the fertile Indus and Ganges basins. New Delhi has made this worse by applying only limited regulation to groundwater extraction and by subsidizing electricity, which, among other things, helps makes pumping water more affordable. At the same time, the municipal sector has come to rely on groundwater to meet more than 80 percent of the urbanized population's growing demand. India's current water withdrawals add up to between 630 billion and 760 billion cubic meters per year, and this is set to expand. India’s population is increasing at an average annual rate of roughly 1 percent, and urbanization rates are high, at 31 percent in 2010 and projected to rise to 43 percent by 2035. The government is also working to increase access to electricity and maintain food security, both of which will require steady water supplies. All of this will contribute to a projected rise in annual water demand to nearly 1.5 trillion cubic meters by 2030 — a number higher than India's existing usable water resources (which the government generously estimates to be around 1.1 trillion cubic meters) can meet. By 2030, most of India’s many river basins could face gaps between supply and demand. At the same time, the nation's per capita annual water supply fell to around 1,500 cubic meters in 2011. This is projected to approach the water scarcity line of 1,000 cubic meters per person by 2050. At the same time, these declines in groundwater levels could actually increase India's water demands by speeding up the rate of urbanization. As groundwater levels decline, wells become more expensive to drill and operate, meaning that more farmers will not be able to afford to water their crops using groundwater. This has already driven many subsistence farmers off the land and into cities. The urban population will increase pressure to supply municipal water and will strain the agricultural sector as India tries to maintain food security in the face of its growing population. India's water constraints will continue to worsen, but the change will be long and gradual, stretching out over several decades. The situation could ease if the country shifts its water consumption patterns or if New Delhi changes its water management policies, perhaps by regulating well drilling, implementing new water-efficient irrigation technologies or making improvements to water infrastructure. Such programs, however, will face the barrier of India's regional political fractures, which make central management difficult. Programs to increase efficiency or improve water management policies, such as the implementation of more efficient irrigation practices, would likely have to be implemented at the state level, resulting in regional (not national) solutions. Indian Prime Minister Narendra Modi, despite hopes to the contrary, will likely be limited by these same geopolitical constraints. New Delhi might manage to make a slow push for higher efficiency by reducing subsidy schemes, as it has done for phosphate-based fertilizers. The phosphate fertilizer subsidy reduction showcases the difficulty of this approach: Other fertilizers are still subsidized, meaning that the problems of pollution and inefficient use or overuse of fertilizers remain. Modi is still unwilling or unable to adjust the broader fertilizer subsidy framework that plays a large role in perpetuating poor agricultural practices. The slow and fractious nature of the reform process means that over the next 20 years New Delhi will continue to cope with increasing water stress. At the present time, India is essentially self-sufficient in agriculture. However, over the next decade, it is likely to become a food importer. Inadequate supply chain infrastructure will impede efficient food distribution. To maintain social stability in the face of this challenge, New Delhi will likely have to sacrifice some economic growth and possibly take on additional debt as its import bills rise. Other recent Stratfor reports on water (when last I checked, the other day, the Sao Paulo report is still open access at the website; the other, older reports require signing up for free access to reports. Stop bad water management! Drive a Prius! "Did dinosaurs create the flowers in the fields?"